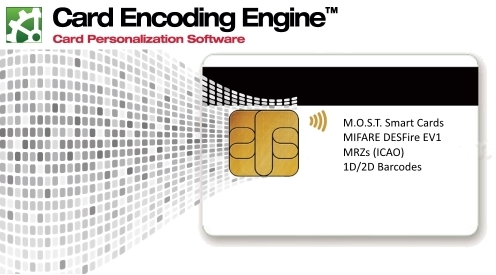 Card Encoding Engine™ (CEE) by CardLogix is a sophisticated instant issuance ID card printer software solution that personalizes smart cards and MRTDs (Machine Readable Travel Documents) with variable and fixed information to the chip for smart card encoding and to the card surface for the widest range of ID credentials. Unlike other photo ID software solutions, CEE is pre-configured to automate inline smart card encoding and personalization without requiring user programming, scripts, or custom APIs. This unique capability saves card issuers several months of engineering time and $5,000 to $15,000 per smart card project. Cornerstone to the idblox™ ID Credential Ecosystem, this powerful all-in-one card personalization solution includes the features found in standard ID card software plus streamlined data collection and smart card encoding capability. 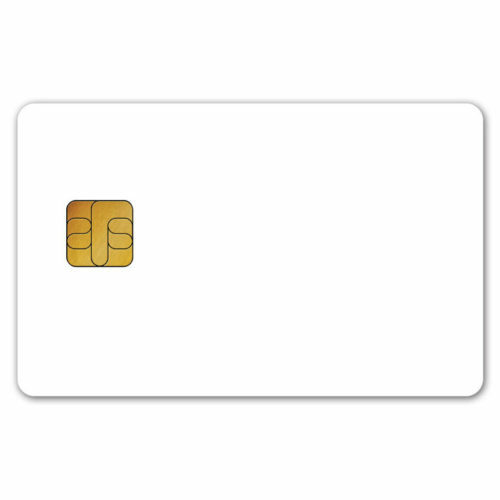 CEE supports the widest range of card technologies while featuring unique cost-saving utilities, pre-designed security background templates, and automated data collection without requiring user programming. CEE seamlessly connects with card configuration tools, biometric and biographic enrollment software, vetting services, credential management systems, and end-use applications for complete ID credential solutions. Card Encoding Engine combines everything you need to design, personalize and issue your cards in four organized workspaces and intuitive, point-and-click user interfaces. CEE enables graphic, magnetic, and electronic card personalization of variable and fixed data on contact and contactless smart cards (ISO 7816 and ISO 14443 A & B), 1D/2D barcodes (including QR codes), ICAO compliant MRZs, and magnetic stripes. The program is built to import data from a variety of sources, and it is optimized for swift biometric credential issuance. The software is built around standardized data elements found across a variety of id markets including driver licenses, health IDs, enterprise badging, education IDs, and a wide variety of government IDs—including national, civil, voting, and military identification. CEE is a central hub in a credential issuance system, exchanging data from a number of sources, for diverse functions including vetting or background checks, physical access system notification and card management systems. 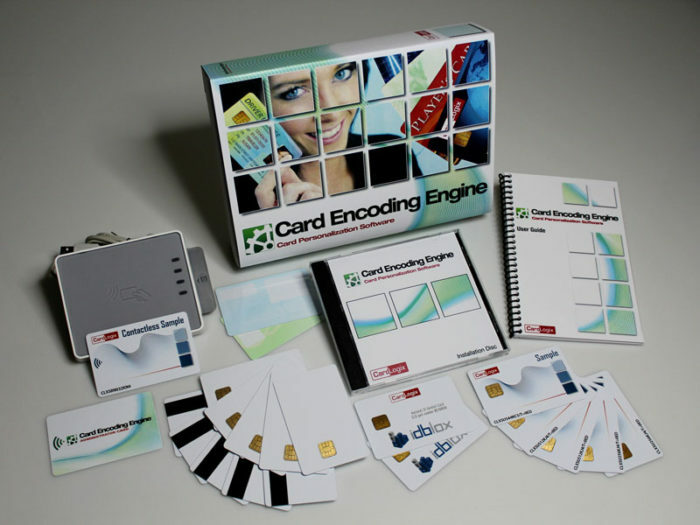 Unlike other card printer software solutions that claim to encode smart cards but actually require extensive programming, Card Encoding Engine does exactly what it claims to do. CEE eliminates the need for programming, scripts or custom APIs on an extensive range of desktop ID card printers. Switching to CEE will save a company $5,000 to $15,000 in development costs per each card type. Card Encoding Engine is a central hub in a credential issuance system, exchanging data from a number of sources, for diverse functions including vetting or background checks, physical access system notification, and card management systems. Pre-configured and custom created Logical Data Structures (LDSs) are seamlessly imported from M.O.S.T. 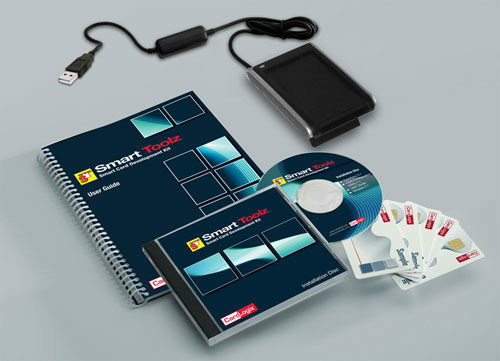 Toolz™ and Smart Toolz® to Card Encoding Engine’s connection workspace using easy drop-and-drag features. The software includes a built-in, mid-range database while allowing imports from XML, MDB, ODBC, SQL, and other external databases and credential management systems. Card Encoding Engine is ideal for system integrators, credential service providers, distributed issuance solutions, and photo ID resellers who wish to expand their product listing and custom credential services. Whether a solution requires smart card chips, RFID, MRZs, barcodes, magnetic stripes, or combination cards, CEE does it all. The program is also built around standardized data elements found across a variety of ID markets including driver licenses, health IDs, enterprise badging, education IDs, and a wide variety of government IDs including national, civil, voting, and military identification. Biometric Enrollment and Issuance in Just Minutes! Card Encoding Engine is specially designed for swift, in-line biometric smart card issuance using an automated importing of standardized idblox data in XML. Corvus Integration’s Raven™ enrollment platform is optimized for this task. 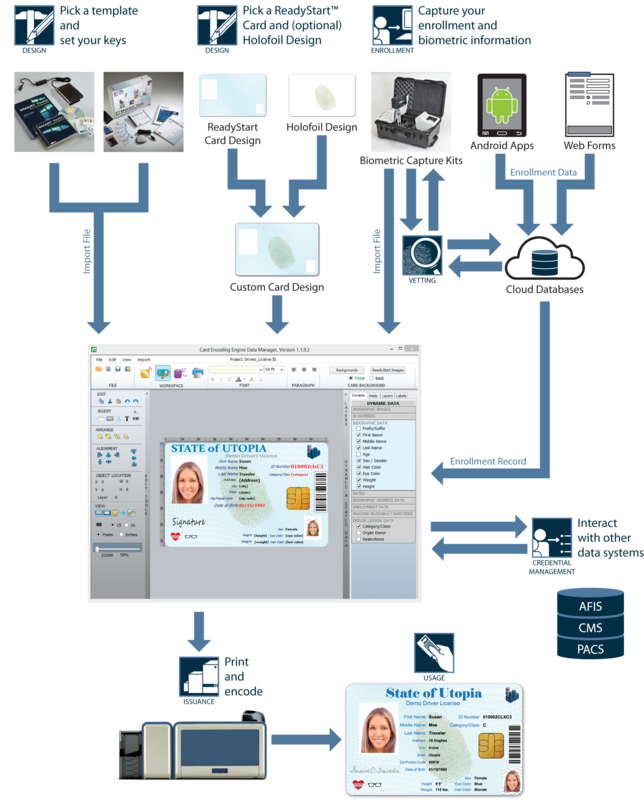 Biographic and biometric data—including face, iris, and fingerprint modalities—are captured, stored, and exported via XML and EFT files to Card Encoding Engine quickly and securely. Now, customers can increase security with biometric enhanced smart cards and multi-factor authentication cost-effectively. All purchases include updates for two years. The Single Station, Multi-User Edition includes free SQL and EFT importing features and Code 39 updates. While a standard, off-shelf version of Card Encoding Engine is available to use today, the software can be fully customized to meet your exact requirements. 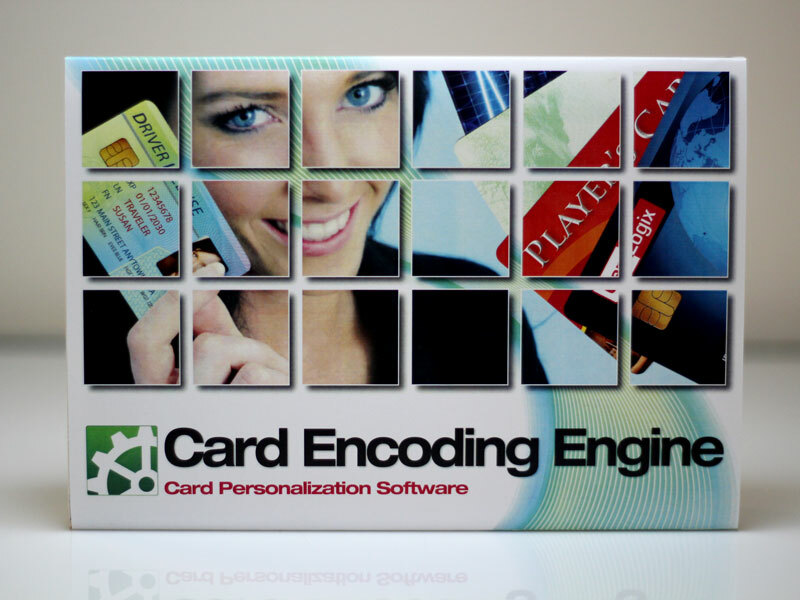 Card Encoding Engine™ ID Card Software does not include an internal enrollment feature. Instead, the software is designed for greater flexibility with the ability to import enrollment data from a wide variety of sources, including desktop, mobile and online enrollment options. Enrollment settings are made in the Connections Workspace. They are then activated in the Encoder Workspace via the IMPORT NEW DATA Panel. Just click the scan button. 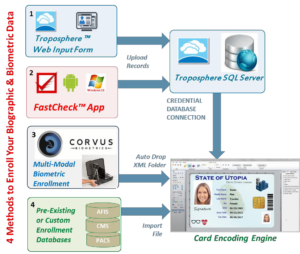 Web Enrollment using Troposphere™. Retrieving your enrollment data from a SQL Cloud connection is easy (This association is set through the CREDENTIAL DATABASE CONNECTION Panel in the Right Slider Panel). See next page for further instructions. Previous Data Enrollments most enrollment databases can be imported to Card Encoding Engine by using the Database Import This utility is found via the File menu pull down in the connection workspace. Before you use your own data with a project, CardLogix recommends using the provided one or both of 2 sets of sample enrollment data to verify your project settings. Normal sample data is activated in the Encoder Workspace under the Production pull down menu. Or, in the same workspace we have provided test XML data found on the Right Slider Panel under the XML FUNCTIONS Data Panel. The provided full User Guide can also help and a importing data format document is also found in the CEE Documents folder for reference if needed. Question: How do I import cloud data correctly? Answer: The data has to be structured in the idblox™ formats for auto import and use. To get the idblox database dictionary see the “CEE Importing Data Guide” document located in your DocumentsCEE folder in the CEE program group. After submitting your information you can find your enrollment record in the Troposphere cloud admin page http://www.clxdemo.com/troposphereAdmin/ (your data may be on page 2. Click next). Custom versions of this structure are. You can also enroll and submit your data to the same location above using the FastCheck™ Android App (coming soon to Google Play). After you have installed and opened the program, open any project. Select the pull- down menu “Production” in the Encoder workspace . Make sure that the option for “Use Sample Data” is deselected (no check-mark should be present). Go to the Connections Open the Right Fly-out Slider (this may take a few moments as some projects are loading the .cfs files). Select the CREDENTIAL DATABASE CONNECTION PANEL. Select [Import From SQL Server Radial button]. Return to the Encoder workspace. Open the Left Fly-Out Automation Slider, open the IMPORT NEW DATA Panel and click the [Scan Troposphere] Your database should import automatically and show each record on the cards. Open the RECORD SELECT Panel and scroll through to your Print if you have setup a printer, or a simulated printing method is available in the “Production” menu pull-down. Question: My enrollment data is not importing correctly. What is the problem? b: The database fields exceed the recommended sizes referenced in the CEE Importing guide found in the CEE Documents folder. Question: My project shows no data or the ID photo on the cards. Why? Answer: There are two scenarios that might cause this behavior. a: You have not selected any data elements for your project in the Project Editor Workspace. These are located in the Right Slider Panel. Be sure to save your work regularly. B: Or you have no enrollment data associated with your project; therefore the card display shows blank. Enable the sample data in the Encoder Workspace. Go to the Production menu pull-down. Select Use Sample Data only, or you can test a database import by using the supplied text XML files. These can be accessed in the Encoder Workspace. Before using these files, turn off (uncheck) the Use Sample Data selection found in the Production pull-down menu, then open the Right Slider Panel and XML FUNCTIONS click Use Test XML files. The displayed card will auto-populate with one of the files. Your project is now loaded with the supplied test data. The other imported records can be viewed via the RECORD SELECT Panel found on the Left Fly-Out Automation Slider. 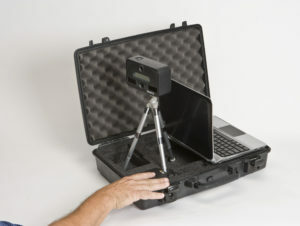 The Micro Booking Station (MBS) is a lightweight and portable biometric identity solution for frontline enrollment of personnel, including government employees, voters, travelers, first responders, and criminal suspects. The MBS is a standalone and complete identity enrollment system in a compact carrying case, for mobile and responsive ID enrollment. Items include the VistaFA2 Iris & Face Camera, choice of fingerprint scanner with smart card reader/writer, signature pad, small laptop computer loaded with Raven™ Biometric Enrollment software, and accessories. FbF bioEnroll combines a simple, intuitive interface with powerful demographic and biometric data capture capability. Integrated with an extensive array of single, dual, and ten-print (live scan) fingerprint scanners, iris scanners, signature pads, standard webcams, and Canon EOS Rebel DLRS cameras, FbF bioEnroll allows you to customize the smartest solution for your exact use case. The EMBER Biometric System is the ultimate portable biometric enrollment system, available for PCs, tablets, and other devices. The system enrolls both biographic & biometric data including fingerprints, face, iris, and signature. EMBER is idblox compatible providing a seamless connection to CEE’s interface. 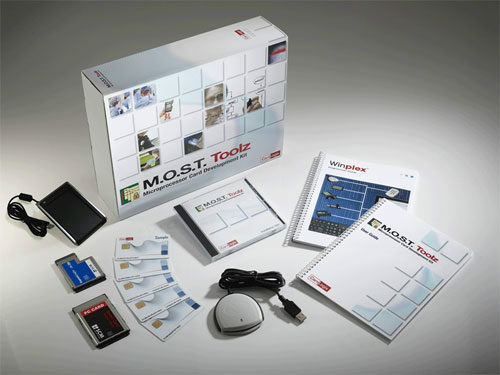 CardLogix M.O.S.T. Toolz Fingerprint Edition includes full demonstration software with source code that enables a developer to capture a fingerprint image, extract this captured fingerprint into an ANSI/ISO 378 template, and compress the image with the FBI and ICAO-required WSQ algorithm for storage. The process is fast and easy. Contact CardLogix today to learn more about Card Encoding Engine, Biometric Smart Cards, and your various ID enrollment options. 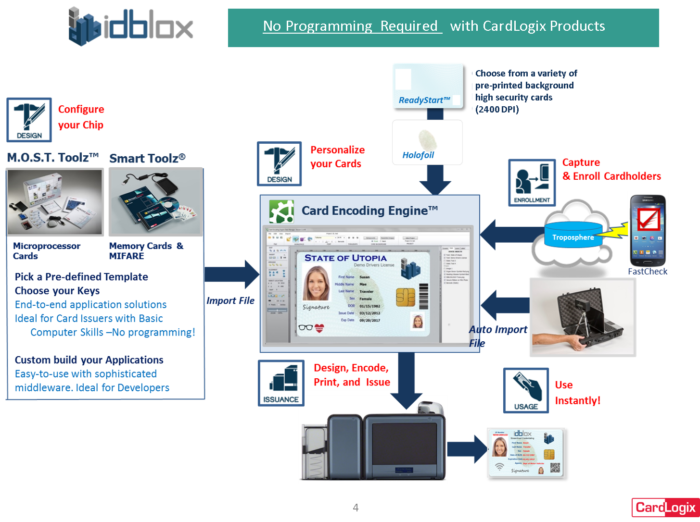 Card Encoding Engine is part of a larger smart card solution, the idblox™ Identity Credential Ecosystem. The idblox ecosystem enables true interoperability among card infrastructure components with the ability to create high-security, multi-functional smart card projects without depending on programmers, system developers, or even graphic designers to get the job done. With idblox, card issuers with basic computer skills can work with out-of-the-box components to create a wide variety of complete, end-to-end card solutions for a diversity of market applications. By using pre-configured idblox templates found in M.O.S.T. Toolz™ and Smart Toolz® card configuration utilities, CEE will not only encode your smart cards without programming, it will issue smart cards that are instantly ready to be used with your system’s card application and terminal. Every product within the idblox framework meets specific security protocols and functions to be idblox certified. For card issuers, resellers, integrators, or system developers, the idblox ID Credential Ecosystem enables the fastest, easiest and most affordable creation of high-security smart card and eID credential programs today. Find out if the idblox approach is right for you. Learn more at idblox.com.